The importance of the 1964-1965 New York World's Fair in the evolution of the Disney parks cannot be overstated. 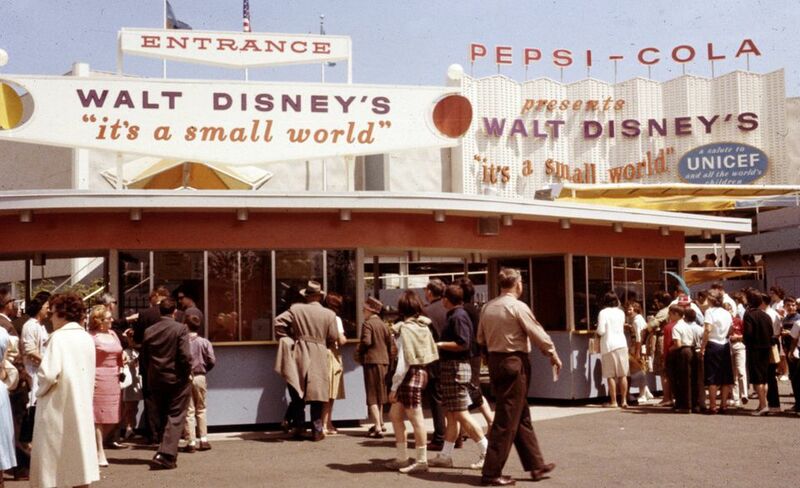 The four attractions that Disney developed for the fair included Ford’s Magic Skyway, "it's a small world" presented by Pepsi-Cola/Unicef, General Electric’s Progressland, which featured the Carousel of Progress, and the state of Illinois’ Great Moments with Mr. Lincoln. To help mark the 50th anniversary of the fair, the International Association of Amusement Parks and Attractions (IAAPA) presented a panel about the seminal exhibition and Disney’s participation in it at the 2014 Attractions Expo in Orlando. Participating in the presentation were Marty Sklar and Bob Gurr, two legendary Disney Imagineers who worked alongside Walt Disney and helped design the attractions at the fair. They provided interesting anecdotes and insight about Imagineering’s groundbreaking and prodigious creative output for the fair. "Other than Disneyland, nothing else so thoroughly changed the theme park industry than the New York World’s Fair," said Bob Rogers, founder and chief creative officer of BRC Imagination Arts and the moderator of the IAAPA Expo panel. In addition to creating four attractions that, in some form, lived on after the fair, Disney’s Imagineers perfected the art of Audio Animatronics, took E-Ticket rides and thematic storytelling to a new level, and perhaps most significantly, demonstrated that Disneyland-style entertainment had appeal beyond Southern California. Disney’s attractions were wildly popular at the fair. Walt Disney had been thinking about expanding his theme park concept to other locations and reportedly saw the fair as a proving ground for East Coast audiences. He must have had confidence in the attractions’ success in New York, however. Sklar said that the same month that the fair opened, in April 1964, Walt Disney bought the first piece of land in Florida that eventually became Walt Disney World. Update: Marty Sklar passed away in July 2017 at the age of 83. He is enshrined as a Disney Legend, and has his own Legends plaque at the company’s studio lot in Burbank, California. Mr. Sklar remained active with the parks throughout the latter years of his life. At the time of his death, he was the only employee to have attended the grand opening of every Disney park around the world, including Shanghai Disneyland in 2016. It Was a Small Window for "it's a small world"
Among the Imagineering team that helped craft the attraction were Marc Davis, who developed the doll figures, his wife, Alice Davis, who fashioned the doll's costumes, and Mary Blair, the artist who was responsible for the overall design and its signature look and feel. As an ode to her contributions, Sklar says the original and all subsequent “it's a small world” rides include a doll made to look like Mary Blair. Despite the compressed time they had to plan and build it, the attraction featured 302 dancing dolls and 209 animated toys. The “it’s a small world” song became an instant classic (and most would say an instant earworm). Richard Sherman, who composed the tune along with his brother Robert, said via a video shown at the IAAPA Expo panel that he originally wrote the song as a slow ballad. When he first played it, Walt Disney suggested that Sherman pick up the pace. The first time he rode the near-finished attraction with Walt Disney, the audio didn’t work and no music was playing. To compensate, he and his brother belted out the tune live from the boat. “It was a surreal and very memorable moment”" Sherman said. The ride, which cost $2 for adults, generated 10.3 million visitors at the fair and was one of its most popular attractions. “It’s a small world” returned, more or less intact, to Disneyland where it opened in a larger show building with some additional and enhanced scenes. Imagineers designed an elaborate facade, which included a fanciful clock, for the California version of the attraction. It has since been a feature at five of the Disney resorts around the world, including the Magic Kingdom version of "it's a small world" in Florida. It is not part of the attraction ix at Shanghai Disneyland. In 2009, Disneyland gave the original “it's a small world” a makeover and included doll versions of some of its classic animated characters. Disney’s revolutionary Audio Animatronic figures did not debut at the New York World’s Fair. The Enchanted Tiki Room, which opened at Disneyland in 1963, was the first fully Audio Animatronic show, but its singing birds and flowers were relatively primitive. The Imagineers, at Walt Disney’s behest, took the technology to the next level for the fair. None of the figures were more complex or advanced than the 16th President of the United States facsimile that they designed for Great Moments with Mr. Lincoln. The project was a personal favorite of Walt Disney. Lincoln was one of his heroes, and Disney felt that the storytelling techniques he and his Imagineers had developed could help bring the President to life in a unique and remarkable way. The attraction is estimated to have cost $1.5 million (which was a ton of money back then). Imagineer Blaine Gibson sculpted the figure using an actual life mask of Lincoln from 1860. Gurr says that animating the figure was especially challenging. The Imagineers created a second Lincoln figures as a backup in case the first one malfunctioned. They installed the second one on Main Street at Disneyland in 1965. The Great Moments with Mr. Lincoln show has periodically closed to make way for other attractions. It is currently open at the California park. The fair show inspired the Hall of Presidents attraction at the Magic Kingdom in Walt Disney World. Lincoln is one of the featured characters in that show and appears alongside all of the other chief executives, including Donald Trump. Whereas Great Moments with Mr. Lincoln introduced one, albeit remarkably fluid and advanced, Audio Animatronic figure, the Carousel of Progress that was part of General Electric’s Progressland pavilion at the New York World’s Fair had a slew of human characters. They were part of a show that demonstrated the importance of electricity through different eras. It was presented in a unique revolving theater. Guests entered one of six 240-seat auditoriums. Arranged in a circle on an an enormous turntable, the theaters revolved around a central stage. (The Chrysler pavilion at the fair used a similar concept at its “Show-Go-Round.” Instead of the audience moving around a fixed series of stages, however, the stage revolved around a stationary audience.) The scenes included the pre-electricity era of the Gay 90s, the dawn of electricity in the 1920s, the post-World War Two 1940s, and the then-near-future of the late 1960s. A family of Audio Animatronic characters talked about the role electricity played in their lives from each period. Gurr said that it was Walt Disney’s idea to include a recurring dog in each scene for continuity. As a bridge between each scene, the Sherman brothers’ tune, “There's a Great Big Beautiful Tomorrow” played. With a capacity of 3,600 guests per hour, over 16 million people saw the GE show. It was the third most popular attraction at the fair. The Carousel of Progress moved to Tomorrowland at Disneyland Park in California and opened in 1967. It closed in 1973 and relocated to the Magic Kingdom in Walt Disney World where it remains to this day. A different show, America Sings, took up residence in Disneyland’s carousel theater. That show closed in 1988, and many of its Audio Animatronic characters migrated to Splash Mountain. While the building remains at Disneyland, the park no longer presents a theater attraction in it. Interestingly, General Electric no longer sponsors the show, although its appliances are still prominently featured. The company, which dates back to Thomas Edison, is moving away from consumer appliances and electronics. For the Ford pavilion at the New York World’s Fair, Disney developed the Magic Skyway. It sent passengers in sleek Mustangs and other Ford convertibles back to prehistoric times and the dawn of mankind. If the GE and Lincoln shows presented impressive human figures, the Magic Skyway featured giant lumbering dinosaurs. Sklar said that at the request of the Ford company, Walt Disney provided the narration aboard the ride. Gurr, whose specialty was designing attraction vehicles including Disney’s monorails and the Autopia cars, said that the attraction’s initial plans called for custom vehicles. “I convinced them that Ford should be using their cars for the ride. It was so obvious to me,” he noted. “It also got me off the hook since I didn’t have to create any vehicles.” After the fair, Gurr said that Ford reassembled the 170 cars from the attraction and sold them as used vehicles. The fourth most popular pavilion at the fair, Magic Skyway generated more than 15 million ticket sales. The Magic Skyway probably inspired the dinosaurs that were part of Ellen’s Energy Adventure at Epcot. That attraction closed in 2017 to make way for a Guardians of the Galaxy indoor roller coaster. There are still animatronic dinosaurs at Disney World’s Animal Kingdom park in the aptly titled “Dinosaur” ride.